You need to unscrew several screws and push the headlamp outwards or even remove it completely to have more hand space to install this LED running light upgrade. If you attempted to install this product without removing the headlamps, any installation damage such as breaking apart the LED circuit board or tearing off the wire will not be covered in the warranty. 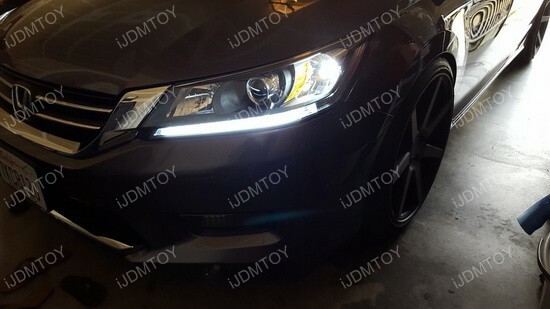 Q: Is this LED daytime running light assembly street legal? A: Yes, this LED daytime running light is street legal because it shines in xenon white which is an acceptable color to use. Q: Will this LED daytime running light assembly fit my car? 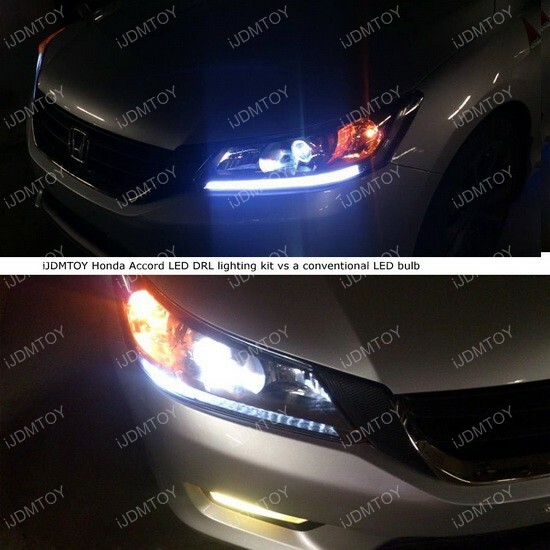 A: This LED upgrade is specially designed to fit on a 2013 and up Honda Accord Sedan. For sedan, you need to unscrew and loosen the headlight to get more "hand" space to process the installation. For Coupe, you must remove the headlight to install this product. Q: Will I have to modify anything to fit this LED daytime running light assembly? A: No, there is no modification required. You do not need to bake open the headlamp housings, but it does require you to loosen or remove the headlight to gain more space to process the installation. Q: Why is the LED strip shorter than the housing? A: The LED strip is intentionally designed to be shorter than the actual housing so that it can sit completely straight inside the housing. Q: Where does this LED get power from? A: This LED assembly replaces the stock parking light bulb, and get powered up from there too. Q: How do I install this LED daytime running light assembly on my car? 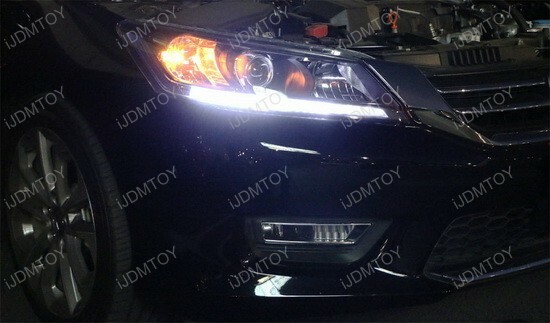 A: Follow our Honda Accord LED DRL Strip Installation guide to learn how to install the LED daytime running light. Q: Does this LED daytime running light assembly require removal of the headlight and/or removal of the housing lens? A: There is no need to open the headlamp but does require you to loosen or remove the headlight to install this product. A: There is an installation wiring guide included inside of the LED daytime running light box. Please follow this wiring guide to connect the wires. 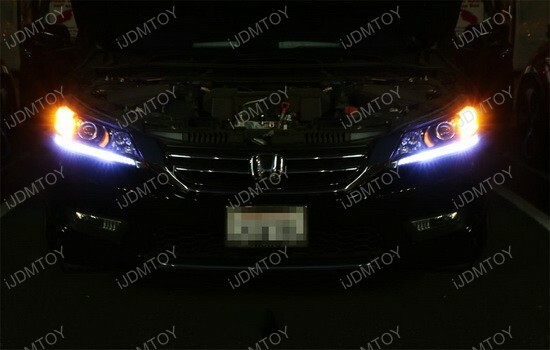 This page features one pair (2 pieces) of specially designed even illuminating LED strips for 2013-2015 Honda Accord sedan to get the OEM-look LED daytime running lights underneath the headlights. 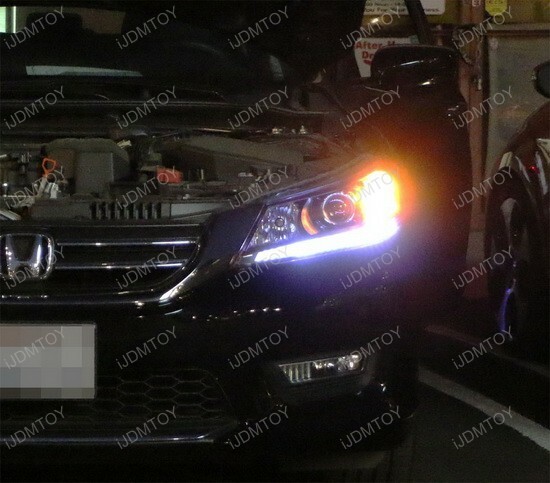 You can install this LED assembly inside the 2013-2015 Honda Accord headlamp without baking nor opening the housing at all. However, you need to unscrew and loosen the headlamps so you will have enough space to insert this even illuminating LED strip through the parking light housing. 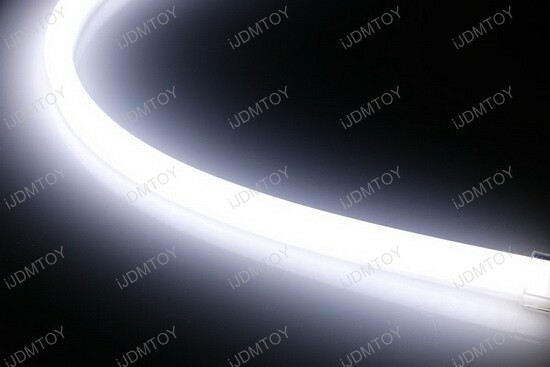 Thanks to its special tubing design, you will not see the individual LED bulbs at all. Instead, when it light's up, you will see a nice uniform output as this entire assembly light up as one piece just like the all new Audi's OEM LED headlights. 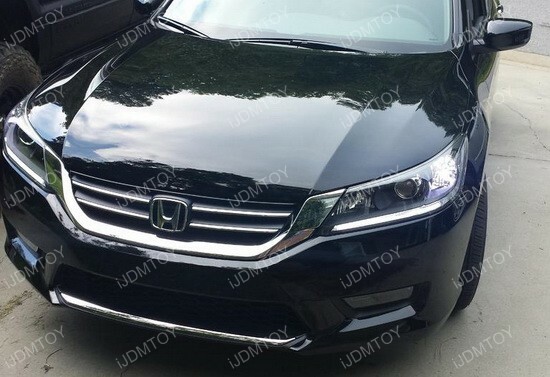 This LED upgrade will give your Honda Accord a premium EX-L style LED daytime running lights look without paying the premium price. 5 of 5 Total Reviews: 48 Write a review. 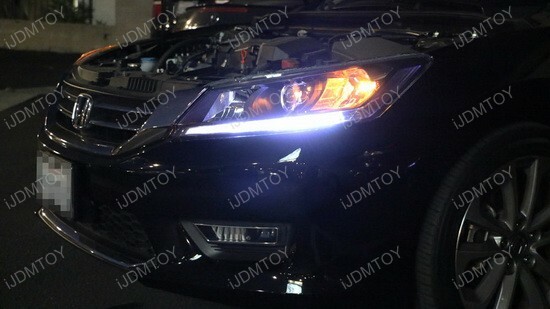 These LED DRL headlight tube inserts look great so far! Install is hard with big hands so have someone with small ones do it for you. Relatively straight forward and results speak for themself. 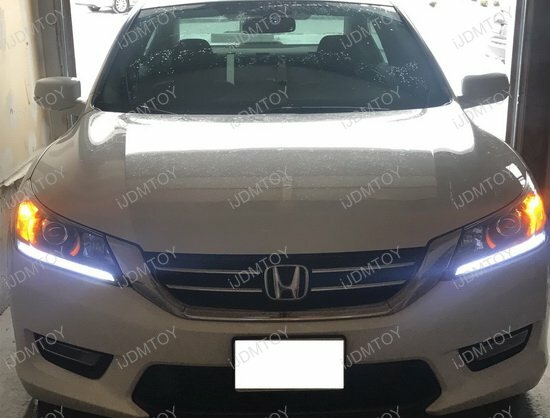 I wanted to spice up my Honda and I was perusing Amazon and found these LED tubes and were blown away. The headlight LED DRLs were somewhat easy to install and looks great at night. As other reviews have said, they are not super bright during the daytime but they still look good to me. I wish I could switch up my daytime lights to have this come on automatically but that would take re-wiring and that could be dangerous, so instead, I just flip the switch to low beams and let those run while I drive through the day. Still looks pretty nice. I do wish they would find a way to make them sit higher up in the slot but you can't even tell at night. I would highly suggest these for any 2014 accord ex-l honda owners. I own a black honda and it looks amazing. 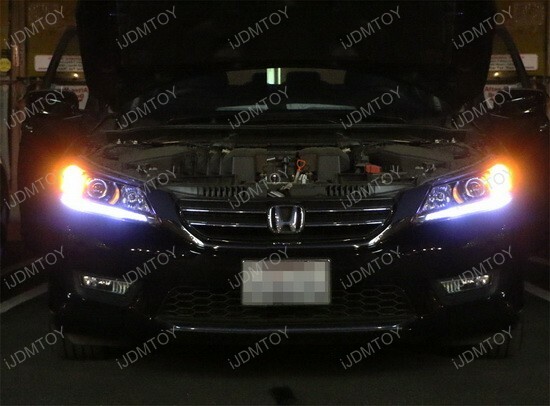 I bought this xenon white LED DRL tube for my 2014 Honda Accord LX. Definitely what I was looking for to upgrade from the OEM marker bulbs. Bright enough to make a noticeable difference and accommodate my LED headlights. My headlights are the Hikari Philips Lumileds. However, these are not bright enough to be used as DRLs. If that's what your looking for, look into another product. I have now been using these for over four months without any issues. 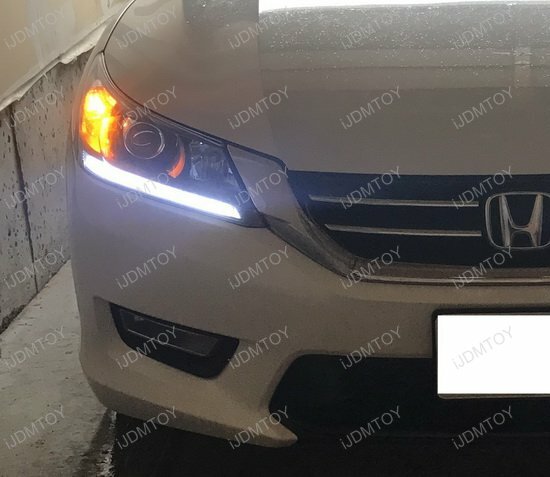 The aftermarket LED DRL tube looks amazing, provides an updated 2016 honda accord vibe to my 2015 sport.